Thailand is celebrating its joyous and rowdy Songkran Festival when Thais and tourists throng in the streets and splash each other with water to cool off from the fierce summer heat. 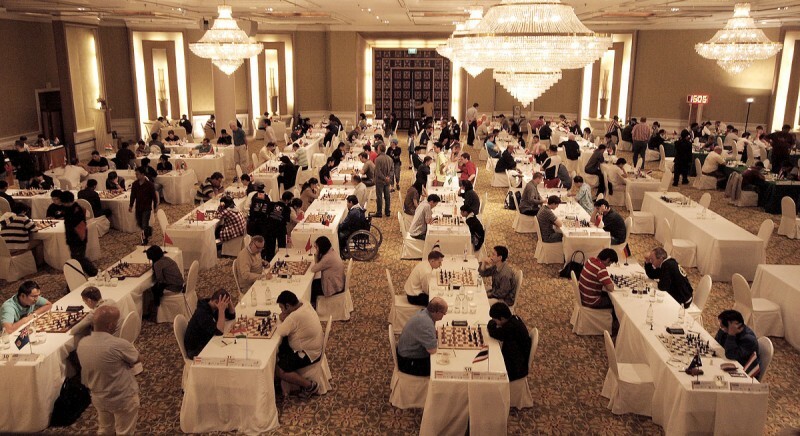 A popular location to “play Songkran” is Bangkok’s Silom District where the Dusit Thani Hotel is hosting the 12th Bangkok Chess Club Open 2012. While the crowds go wild with buckets of water outside the hotel, the competition inside is more restrained but heating up. The tournament’s top seeds, GMs Nigel Short, Hou Yifan, Jan Gustafsson and Farrukh Amonatov won their round-two games in convincing fashion. Surprises included draws between Chinese GM Xiu Deshun (champion 2008 and 2009) and Burmese Sie Thu, as well as German GM Gerhard Schebler and Thai FM Boonsueb Saeheng. If White had played 28. Rxa7, he would have lost a bishop to 28..Rxa7 29.Bxa7 Qa2. Instead 28.Qg3 would have been fine, but the game move was refuted by 28..Nd3 which put black on the attack. 29.Bxd3 made things worse, whilst 29.Qg4 would have put up more resistance. Gustafsson secured a quick victory with 29..Bxa1 30.Rxa1 exd3 31.Qxh6 Qf6 0-1. Surprise results on the top boards in round three were Sander Severino (PHI) 1/2-1/2 GM Nigel Short (ENG), GM Jan Gustafsson (GER) 1/2-1/2, IM Daniel Contin (ITA), GM Shojaat Ghane (IRA) 0-1 GM Hou Yifan (CHN), GM Farrukh Amonatov (TJK) 1-0 IM Nisha Mohota (IND). After laborious games in rounds one and two, GM Hou Yifan seemed to have found her comfort zone as in round three she went on the attack with black against Iranian GM Ghane: 1.d4 Nf6 2.c4 e6 3.Nc3 Bb4 4.Qc2 0–0 5.a3 Bxc3+ 6.Qxc3 Qe8 7.Nf3 b6 8.e3 Bb7 9.Be2 d6 10.0–0 Nbd7 11.b3 Ne4 12.Qc2 f5 13.Ne1 Rf6 14.f3 Ng5 15.e4 f4 16.Nd3 e5 17.d5 (closing the center allowed Hou Yifan to push on the kingside) 17..Qh5 18.Nf2 Rg6 19.Qd3 Nf6 20.Rd1 Bc8 21.Ra2 (The rook was supposed to protect the second row, but it was soon lost) 21..Rh6 22.h3. A sacrifice was in the air. And there it was: 22..Bxh3 23.gxh3 Nxh3+ 24.Nxh3 Qxh3 25.Bf1 Qh1+ 26.Kf2 Rh2+ 27.Ke1 Rxa2 28.Rd2 Rxd2 29.Bxd2 Nh5 0-1. 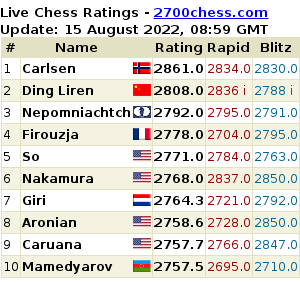 After round three only seven players have a perfect record: GM Hou Yifan (CHN), IM Ngyuen Duc Hoa (VIE), IM Liu Qingnan (CHN), GM Amonatov (TJK), IM Venkatesh (IND), IM Wynn Zaw Htun (MYA) and FM Voigt (GER). BCC President and Chief Organizer Kai Tuorila is satisfied with the second day of play and glad that the Challenger category also got off to a strong start with 95 players, including a great number of youngsters, making this edition of the BCC Open the best-attended so far with a total of 230 players. The top seeds in this 7-round under-2100 Elo contest are S. Bharath (IND, Elo 2074), S. Raghuraman (IND, Elo 2069) and FM Manish Hamal (NEP, Elo 2056). Since in the first round S. Bharath already dropped half a point against Kyz Llantana (PHI, Elo 1672), this group promises interesting battles and upsets too. Follow games from the top 4 boards live on the BCC website.